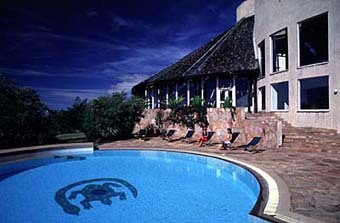 Mpata Safari Club sits high on the edge of the Oloololo escarpment with panoramic views across the Masai Mara Plains, adjoining the Masai Mara National reserve, i.e.," Kingdom of Wild Life in East Africa". Guests stay in 23 separate cottages well-spaced along the top of the escarpment. There are 11 Suites and 12 Delaxe units, each with interlocking curves separating bedrooms, bathroom and verandahs. The chief feature of the deluxe room is the panoramic sweep of the Mara which you can see from your bed. The suites have similar views and are larger with a lounge, kitchenette and, best of all, a Jacuzzi. The units are reached by stone pathways meandering between indigenous bush and trees which help to soften the towerlike structures. Pick from your Hotel or JKIA and transferred to Wilson Airport for the scheduled flight to the world famous Masai Mara Game (Wildlife) Reserve. The Mara is actually the northern portion of the great ecosystem in neighbouring Tanzania called the Serengeti. It is the home of the "big five" - loin, leopard, buffalo, rhino and elephant as well as cheetah, zebra, giraffe and vast herds of plains antelope and numerous other wildlife. 1. A guided tour by our professional naturalist in the natural surroundings of the Club, which lies just outside the Reserve but still teems with life. 2. Float in the breeze over the Savannah in Balloons that give you a unique vantage point , ending in a Champagne breakfast. 3. A tour of the Masai Mara is never complete without a visit to the intriguing Maasai villages which impact a sense of love for mankind and wildlife. 1. Return flight from Nairobi to Masai Mara and Back. 4. Airstrip transfers in Masai Mara. 1. Park entrance fees/conservation fees. 2. All items of personal use i.e laundry, telephone calls, drinks, personal travel insuarance.